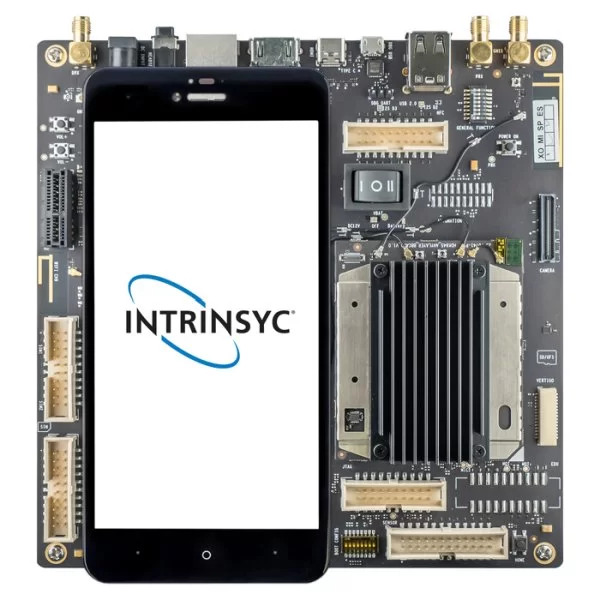 Intrinsyc’s new Open-Q 845 HDK Development Kit has the same Mini-ITX (170 x 170mm) dimensions and sandwich-style design as the Open-Q 835 from the previous year. The main SoC, Snapdragon 845 is integrated into the board topped by a heatsink. This dev board includes a smartphone like 5.7-inch QHD (1440 x 2560) touchscreen controlled via MIPI-DSI, as well as a camera board with dual rear-facing cameras and a front-facing camera. The Open-Q 845 runs Android 8.0 on the Snapdragon 845 SoC with 6GB LPDDR4x RAM. The Snapdragon 845 SoC is equipped with 4X high-performance Kryo cores (up to 2.80 GHz) and 4X low-power Kryo cores (up to 1.8 GHz) and the graphics processing is handled by the new Qualcomm Adreno 630 GPU. There’s also a microSD slot and a 128GB UFS 2.1 flash drive. Like the Open-Q 835, the board offers Bluetooth 5.0 + BLE along with 2.4/5GHz 2×2 802.11a/b/g/n/ac and the latest WiGig60 802.11ad WiFi with an onboard antenna. This board is further enhanced with a GNSS daughter card with GPS, GLONASS, COMPASS, and Galileo support and a PCB antenna and SMA connector option. There are mini-PCIe and PCIe slots for further wireless and peripheral expansion. Video ports include DSI-driven HDMI 1.4 port, USB 3.1 Type-C DisplayPort, and dual 4-lane MIPI-DSI connectors. There are also 3x 4- and 2-lane MIPI-CSI ports on a single 120-pin connector that support dual 16-megapixel or a single 32-megapixel front-facing camera. This kit supports the Snapdragon 845’s capability for 4K @ 60fps, 10-bit HDR video playback and capture using H.264 (AVC) and H.265 (HEVC) compression. The audio department is handled by Qualcomm audio codec driver. It supports a headset jack and analog audio input and output headers. There are several I/O ports like DP-ready USB 3.1 Type-C, 2X USB 2.0 host ports, and a micro-USB serial port. Other additional features include NFC and sensor expansion headers with I2C, SPI, UART, and GPIO. The dev kit includes a power management function, as well as 12V/3A input from wall adapter and a 3000mAh Li-Ion battery.